UPDATE: One of our readers posted the following email from Civitas Media in the comments section of this post. Civitas Media never had any plans or intentions of publishing in print or online lists of holders of “conceal and carry” permits. Nor will Civitas Media develop databases of permit holders. A poorly crafted internal memo meant to highlight editorial discussions and planning incorrectly indicated that such a database was being planned; it has been considered and rejected. According to the Buckeye Firearms Association (those guys do great work in Ohio), Civitas Media, which owns more than 80 newspapers across the country, is seeking to build a massive, state by state registry of all gun owners with carry permits. The company plans on using publicly available records and open records requests to make the database happen. We are launching two enterprise projects across our newsrooms this month. The first will deal with the creeping influence of heroin in our communities. The deadly drug has quietly taken over, reaching across all age groups and eclipsing meth as the recreational drug of choice. The second project examines the explosion of “conceal and carry” gun permits across the U.S. Through public records act requests, we will attempt to build state-by-state databases that list those who have the right to carry a concealed weapon. 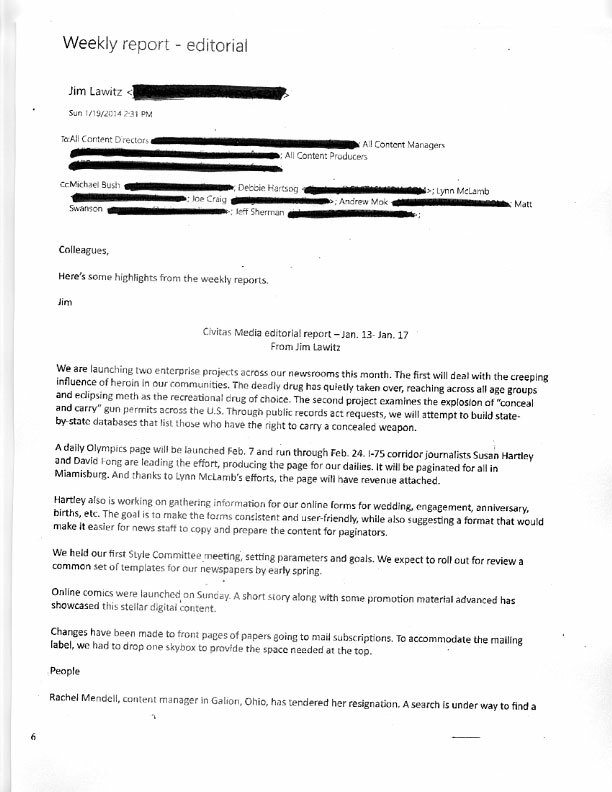 They even have an original copy of the email on their site (private contact information is redacted). Hmmm. That’s comforting. So you don’t want to publish the names of carry permit holders and gun owners, you just want a proprietary database filled with their info. Yeah, comforting.